We customize each plan to fit your exact business needs! No contract required, upgrade or downgrade anytime. Great way to boost your website traffic and encourage repeat visitors. Kick Start your Social Marketing! Engage your audience, get more likes, more followers, and boost social activity. 30 Frames per second in Full HD 1080p widescreen resolution. 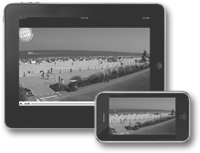 Consistent viewing experience across any device - smartphones, tablets or desktops. Engage your viewers - broadcast your prime location with interactive real-time content. A webcam can be the focal point that can help you keep a leg up in your industry. Have a webcam project in mind? Contact us to learn how easy it is to stream a webcam from your location. Consistent viewing experience across smartphones, tablets, desktops. Webcam perfectly re-sizes to any device. Contact us to learn how easy it is to stream a webcam from your location. Copyright © 2016 & All Rights Reserved by Vista Webcams.